LOCATION This detached family home sits in a popular village location. PROPERTY The front door opens into a Hall, which has stairs leading to the first floor and doors opening to all Ground Floor rooms, including the WC. This attractive family home boasts two separate Reception Rooms, a Dining Room perfect for entertaining and a Living Room with double doors spilling out to the Rear Garden. 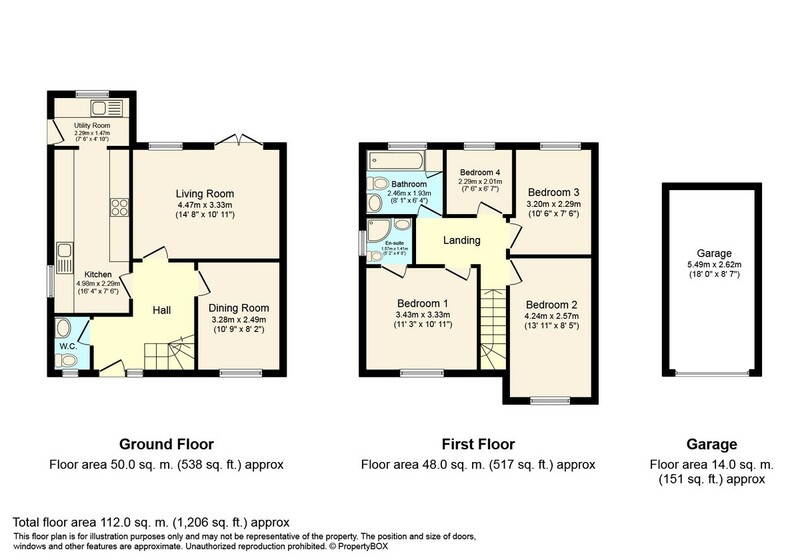 Completing the Ground Floor layout is the 16ft Kitchen, which has a breakfast bar and space for a selection of appliances, and leads through to the Utility Room. To the First Floor is the Family Bathroom with a shower above the bath, and Four Bedrooms, with the largest three being fantastic doubles. The master Bedroom boasts built in Wardrobes and an En Suite Shower Room. OUTSIDE The property is tucked away with private off street parking for two cars. The driveway leads to the Detached Garage, which measures 18’0 x 8’7 and has an electric roller door. The Rear Garden is South West facing with a large paved patio, perfect for barbecues in the summer months, leading on to an expanse of lawn which is ideal for the children to play or for keen gardeners to make the most of.